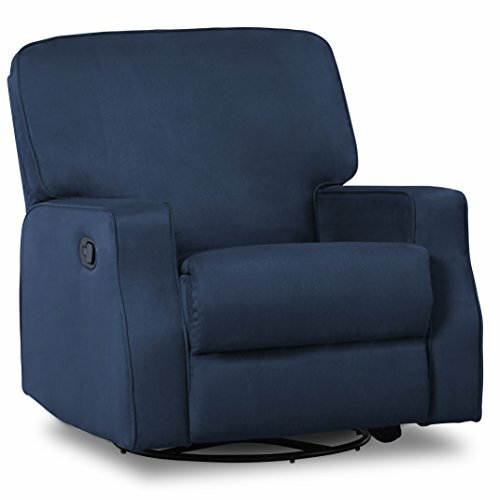 The Caleb Nursery Recliner Glider Swivel Chair from Delta Children does it all-its gentle rhythmic gliding and swivel base allows you to control the motion as your baby drifts off to sleep, plus it reclines quietly so you don't wake them up. The chair's easy-to-reach reclining mechanism offers two recline positions, you can keep the seat upright and just prop up your legs or fully recline. A cozy place for you and your little one to kick back and relax, this nursery chair features a wide back for lumbar support and firm armrests that help with feeding Baby. And the comfort lasts way after your baby outgrows the need for a nursery chair, so you can use it as an accent chair in any room in the house. Delta Children was founded around the idea of making safe, high-quality children's furniture affordable for all families. They know there's nothing more important than safety when it comes to your child's space. That's why all Delta Children products are built with long-lasting materials to ensure they stand up to years of jumping and playing. Plus, they are rigorously tested to meet or exceed all industry safety standards.